Lawyers for Botham Jean's family say an affidavit for the arrest of Dallas police Officer Amber Guyger attempts to 'condone' the shooting of the 26-year-old accountant inside his own Dallas apartment. 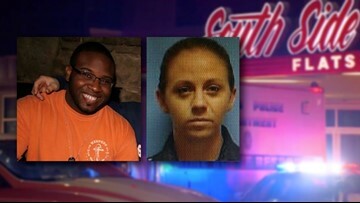 DALLAS — The attorney for Botham Jean's family said they have witnesses and information that they believe refutes Officer Amber Guyger's account of what led to the shooting of the 26-year-old accountant late Thursday night at his Dallas apartment. According to an arrest warrant written by the Texas Rangers, after a more than 13-hour shift, Guyger mistakenly went to the wrong apartment a floor above hers believing it to be her residence. Once at the door, she found it "slightly ajar," the warrant alleges. However, attorney Lee Merritt said according to witnesses he's talked with, that conflicts with their statements. Merritt said at least two witnesses claimed to have heard knocking on a door followed by the voice of a woman, believed to be Officer Amber Guyger, say, "Let me in; let me in." Merritt said that would mean the door was closed at the time Guyger approached the apartment. One of the witnesses said after she heard the gunshots go off, she heard a male voice say, "Oh my God, why did you do that?" The attorney said he's passed this information on to the Dallas County District Attorney's Office. "For them, it began to change the direction of how they were looking at the case," he said. And according to family members, the attorney said, Jean was a "meticulous individual, and a person about his routine." "That means that when he comes into a room, he makes it a point to close the door behind him," Merritt said. "He hangs his keys on the hook. He put everything in a particular place." Merritt also said Jean purposely purchased a red doormat, which was outside his door the night of the shooting, to make sure no one would mistake his apartment for another. "In fact, to ensure no one mistook his apartment, the way this officer is claiming in this case, he went out and bought the biggest, brightest, red rug and placed it right there at his doorstep," the attorney said. Attorneys said they believe the affidavit is an attempt to "condone what happened, give her a break." The attorneys also questioned why the Dallas Police Department handed over the investigation to the Texas Rangers after Chief Renee Hall announced they planned to charge Guyger with manslaughter. "They gave this officer an additional day or two to craft up a story that our client [Botham Jean] is not here to defend," said an attorney. A search warrant created by the Dallas Police Department before the Texas Rangers' arrest warrant said Jean approached the door with her key fob and found it open when she placed her key inside. She told Dallas police she believed maybe Jean was waiting for someone. It's still unclear how far Jean was from Guyger at the time of the shooting. According to the initial DPD search warrant, Jean "confronted the officer at the door." However the arrest warrant from the Texas Rangers said Guyger saw a large silhouette she believed to be an intruder "across the room in her apartment." Jean was shot twice, and later pronounced dead at Baylor University Medical Center.